As the CEO of a multinational corporation that sells superpowers to the highest bidder ("the finest superpowers money can buy"), you'll cast powerful magic, invent futuristic technologies, and manipulate your stock price to impress shareholders. 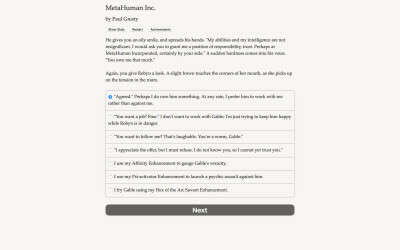 "MetaHuman, Inc." is a thrilling 260,000-word interactive novel by Paul Gresty, author of "The ORPHEUS Ruse." Your choices control the story. It's entirely text-based--without graphics or sound effects--and fueled by the vast, unstoppable power of your imagination. 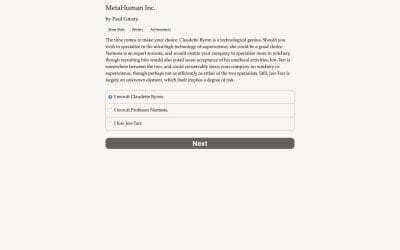 MetaHuman's mission statement is, "Building Better Humans." Will you prefer to hire mad scientists, warlocks, or a mix of both? Will you eliminate your competitors, acquire them, or seduce them? Will you save the world from the problems your company has created, or will you embezzle enough money and power to flee the country instead? MetaHuman, Inc. Our dark magic, our superscience, your solutions! 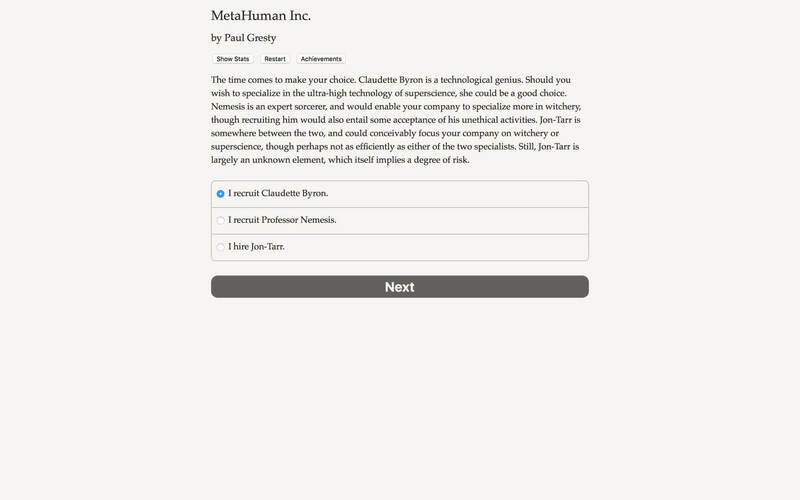 No matter how you play it, you'll be in for quite a time as MetaHuman's totally unprepared CEO.